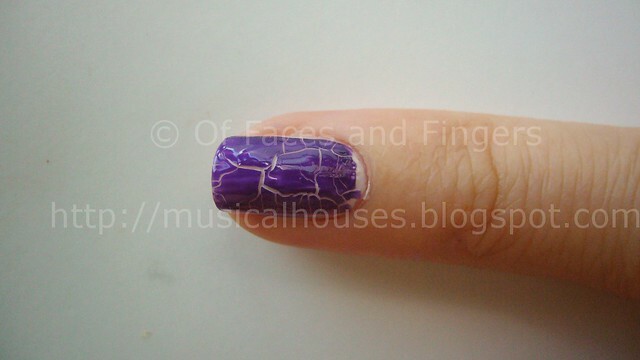 Kelier Purple Shatter Nail Polish NOTD: Shatter is now Colourful! Wow, trends sure move fast! 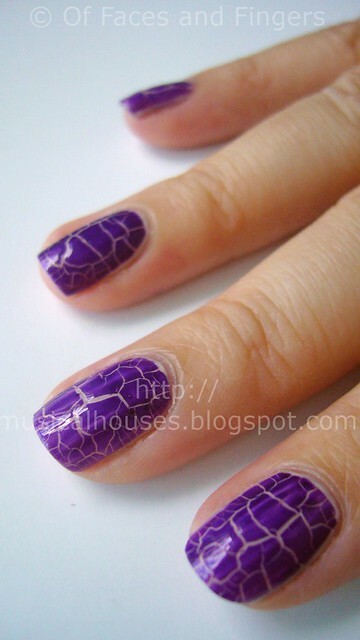 Remember back in ye goode olde times (well, more like a few months ago) when shatter/crackle polishes only came in boring black? Now, if you've ever wanted to shatter in a more colourful manner, you can! First it was China Glaze, and now all the other nail polish companies are following suit! Finally, the colourful shatter trend has trickled down to the comman woman, and shatter polishes are now available for cheap - and in colour. I got my Kelier Nail Instant Cracking Nail Polish from Born Pretty Store, where they are currently selling them in a variety of colours for the low, low price of US$4.52 per bottle - and you get a discount if you buy more than one! As I'm sure you know, the Hong Kong-based Born Pretty Store has been on the radar of nail bloggers of late, for their cheap supply of nail products and tools. 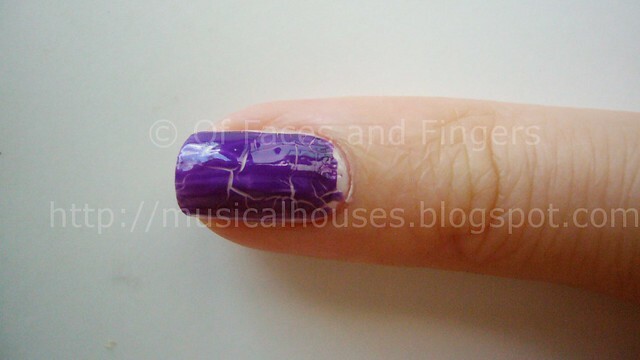 Here are the results of the Kelier purple shatter polish on my nails. The base is Color Club's Who Are You Wearing?, a beautiful (if sheer and annoying to apply) off-white colour with a tinge of griege, that purple-grey hybrid that's been so popular in nail polish collections since 2009 or so. One of the first things I noticed about the Kelier shatter polish is that it takes longer to dry and shatter on your nail. If you watch, you can even see the crackle lines forming! I even had enough time to take a few quick snaps, so you can see the polish shattering! Here is what the polish looks like when first applied. As you can see, there aren't any shatters yet. 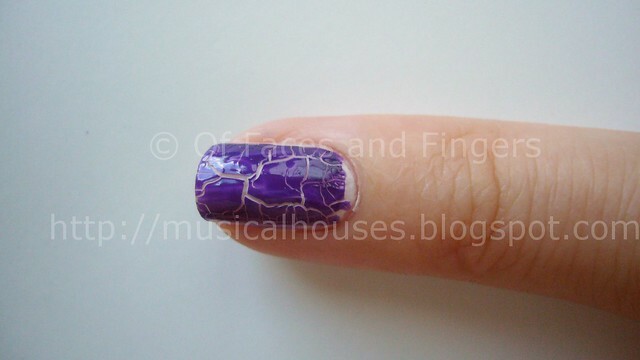 As with other shatter polishes, how thick or thin the polish is influences how it crackles. 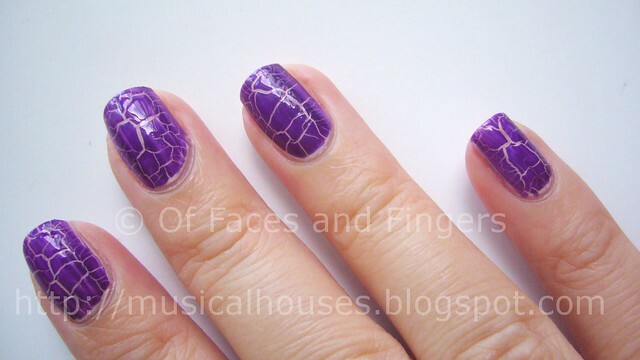 Just like the Barry M Instant Effects Nail Polish, the thicker the layer, the less cracks you get, and the larger the cracked pieces are. So depending on how shattered you'd like your polish to be, you can adjust how much polish is applied on the nail. As you can see in the photo below, the ring finger has the thickest layer of polish, while the index finger has the thinnest layer of polish, and both shatter differently. One of the things that I found odd about the Kelier purple shatter polish is that it peels off very easily, even with topcoat over it. Even though I had topcoated over this mani, I found that the smaller cracked pieces were starting to peel off the next day. I'm not sure why this is - perhaps the polish dries too slowly. I'm speculating that some fast-dry drops may help, but it is a little bit of a disappointment. One last thing I noticed is that this is hard to get off. It doesn't remove easily, making removal a bit of a pain, but I suppose it's worth it for the cool purple shatter effect, right? So would I recommend this? 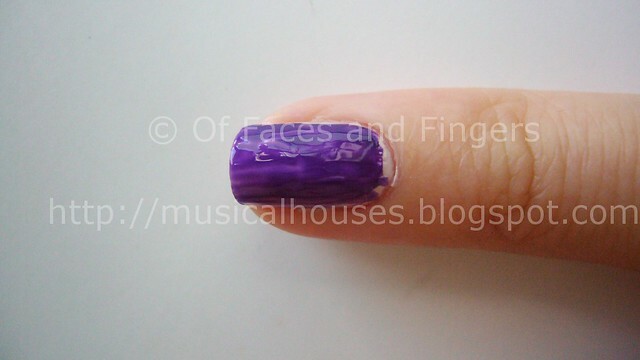 Yes, as a cheap, easily-available alternative to some of the other coloured shatter polishes out there. For my girls in Asia, who find China Glaze's coloured shatter polishes difficult to get hold of, this could be an easier to find alternative. However, the problems I had with peeling and the difficulty of removal mean that I would love this polish more if the formula is improved. Just a little correction, it was actually covergirl that came up with crackle polishes and this dated at least 10 years ago. They had black, white, blue and orange... and if I remember correctly, CHG came out with 6 different coloured shatter polishes. As for this colour, it is gorgeous. I love how you've taken photos of your nails as it was shattering, fun to watch especially since I don't have any crackle polishes... yet, lol! i actually like the direction of crackling instead of the O.P.I, but I wished it separated more to see the color underneath. That reminds me of a turtle shell! I have to say I'm loving the purple shatter. I these look better with colour rather than just plain black.